I just got to be part of the coolest musical event. My friend Mary Ellen is having a landmark birthday – you know, one of those big round numbers with a zero after it where everyone says you need to have a party and invite all your friends from different areas of life. But Mary Ellen had a better idea. She’s a multi-instrumentalist and singer who’s part of numerous music communities around the Front Range (and around the world!) and so instead of the usual awkward unstructured birthday mingle, she decided to have a concert/recital in which she performed a variety of songs with “musical colleagues” from all of her different spheres. This would bring together people who didn’t know each other and give them something in common, and it would raise money for several charities that work in Africa and the Middle East – where (just a few of) the musical traditions she practices in originate. Imagine what a delight and honor it was for me that this lovely being thinks of me as a “musical colleague”! I got to accompany her on guitar for a few songs, assist with leading rounds for the whole group to sing, and be part of some a cappella pieces. Some of the people I sang with were old friends and some were people I had just met, but the shared purpose of celebrating Mary Ellen’s rich life and uplifting those who were gathered for the concert created a powerful heart attunement. Anyway. She divided the program into sections by type of music. Once the parts I was involved in were complete, I got to sit back and enjoy a whole different style. This friend is a very accomplished teacher of marimba, and she plays with several marimba ensembles – which all came together to perform for this event, creating an incredibly joyful sound. And as she was introducing the marimba groups, she also mentioned that a lot of the music that is today played by marimba groups was actually composed for a different and very old traditional African instrument: the mbira. 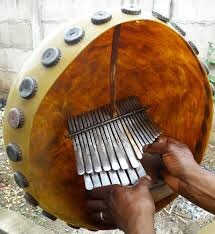 The mbira is an instrument that’s made up of a number of metal tongues attached to a board. You play the metal pieces with your thumbs, and each one is a different note. The sound is clear, melodious and rippling – it reminds me of a flowing stream. Traditionally, this part of the instruments would be placed inside a large gourd with a big opening cut out for the player’s hands to reach in. The gourd was a natural amplifier. But there’s more to it than just volume. The gourd would also have shells and (more recently) bottle caps loosely attached to it, so that they would rattle and buzz when the mbira was played inside the gourd. This is part of the instrument in its classic form. The idea, as Mary Ellen explained it to me, is that the other sounds in the environment in which the music is played are PART OF the music. The light buzz of shells and bottle caps stand in for ALL the other sounds. Cars passing in the road. Your heartbeat pounding in your ears. These sounds are all part of the music that’s present when the instrument is being played or the voice is singing or the radio is on. Yes. The static when the radio station is far away: Is part of the music. See? It’s a small thing – the size of a Coke bottle cap, the old metal kind. But it blew my freaking mind. This concept literally altered the way I look at music – especially community music, which is what I mostly do, but also things I compose for performance. When my guitar strings rattle – ok, that’s part of the music that’s here today. When someone’s coughing: part of it. When an ambulance goes by with siren wailing: those are also notes in the song. When someone looking for the bathroom accidentally walks through the room where we’re chanting: That’s part of the prayer. Sure, I’ve had those moments when the pure sound of a perfectly tuned choir or orchestra fills a silent concert hall and everyone’s holding their breath so as not to miss a second of this otherworldly beauty, and I’m in no way saying that’s not a gorgeous thing. We need that too! But even in those halls, and even when everyone is using their best concert etiquette and no one so much as shifts in a creaky chair – there are still other sounds present. Your own body is constantly making sounds, and they’re part of what you hear when you hear music. From this perspective, all existence is a constant symphony, layered with infinite richness, sometimes harmonious and sometimes dissonant. Sometimes someone is playing music in an obvious way – sometimes it’s simply playing, the world singing, and humming and drumming and bowing and blowing and whistling and rattling like she always does, all the time. When I look at it this way, I can’t see ambient sounds – or missed notes – as ruining a song. It’s more like – a different song. I remember that even when I’m up there playing on stage, there are so many elements, so many spirit beings, who may have something to contribute to the song of the moment, and who are utterly uncontrollable by me. I can resent and resist them, or I can see them as part of the magic. So – thanks for that, Mary Ellen. And happy birthday!